From this shot, it looks like the plant is a pyramidalis arborvitae (Thuja occidentalis 'Fastigiata'). Check the trunk at the soil line to make sure it's not injured or damaged. 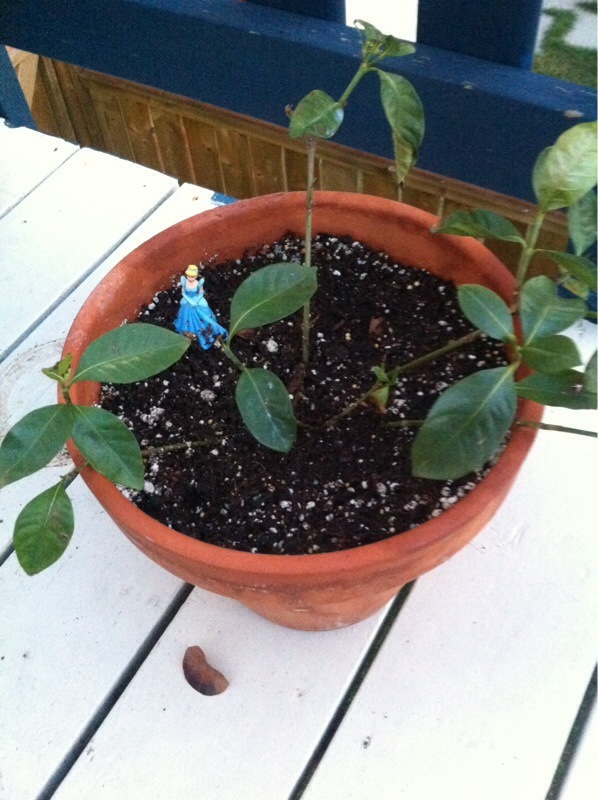 Gardenias are notoriously difficult to grow in normal indoor conditions. And in Calgary, they don't much care for the outdoors either. Unfortunately we cannot identify the cultivar or species of rose because there are over 150 wild species of shrubs and climbers native to Asia, Europe, North Africa and North America, plus thousands of different garden forms of varying growth and flower types divided into two broad categories Old Garden Roses and Modern Roses. However, when it blooms in the spring we suggest you contact your local rose society or a horticulturist at your local garden center that specializes in roses and hopefully they can identify further for you. Also there are many helpful websites including: www.helpmefindroses.com as well as your local rose society. All roses do best in full sun with regular water and feed with a slow release or organic fertilizer formulated for roses. 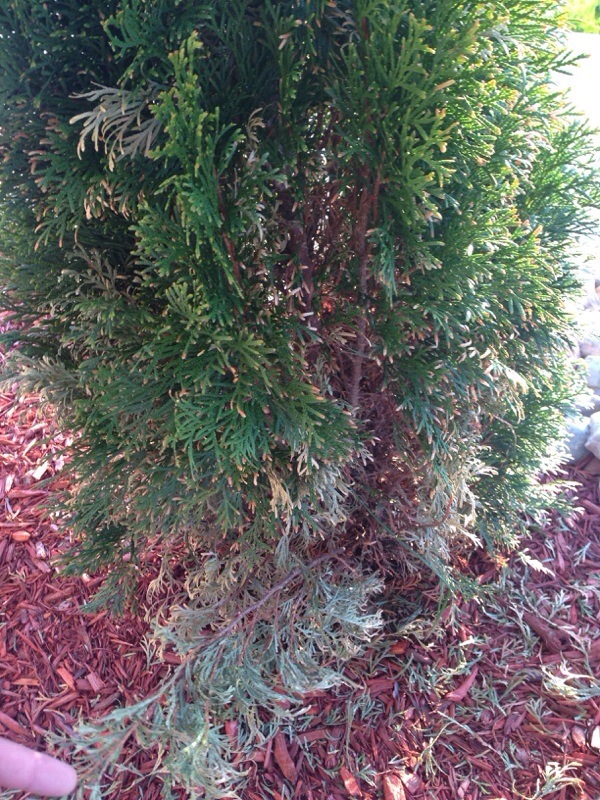 This is a juniper and junipers generally don't respond well to pruning unless it's done by a practiced professional. (And we don't mean a mow-and-blow guy who comes in with a chain saw or electric trimmer.) To prune them correctly they should be cut back to individual crotches, removing entire limbs and preserving the natural shape of the shrub. These junipers will continue to get larger; they're slow growers, but can easily reach 5-6 feet. It seems like you're dissatisfied with the size of many of your trees and shrubs which indicates either that you moved into a house with existing landscaping or that someone planted these without knowing what their ultimate size would be. Maybe you should remove them and plant something that will stay closer to the size you want. 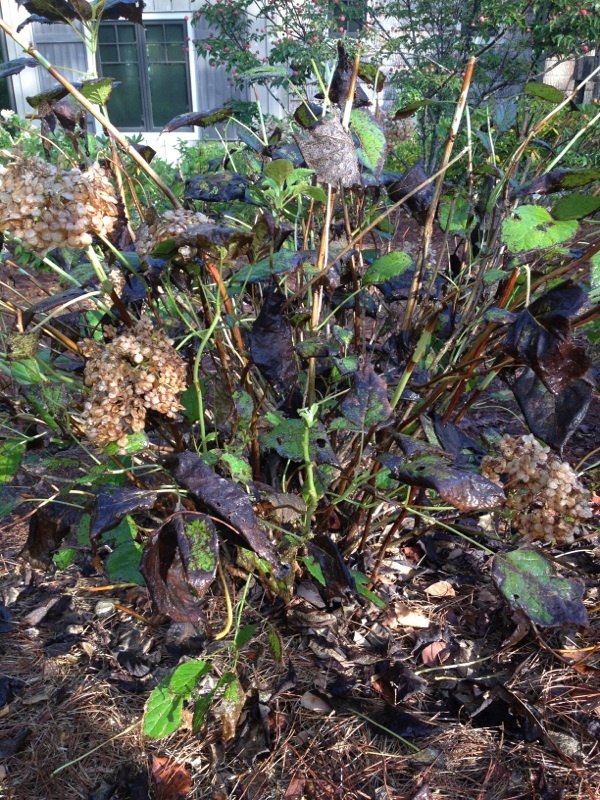 The black sooty mold is probably the result of sucking insect damage such as aphids, mealybugs or scale and the white powdery substance is likely mildew or it might be due to whitefly. For sucking insects and mildew spray with a suffocant such as a horticultural oil but spray in the early evening to avoid burning the foliage during the heat of the day. There are also chemical systemics available for ornamental plants as another option, but you would need to get rid of the current problem first and the systemic would be for future control. If you have whitefly, spray with Spinosad, another organic control for chewing insects. Spray after the bees have returned to their hives in the early evening. Once the spray is dried, it is not harmful to beneficial insects. 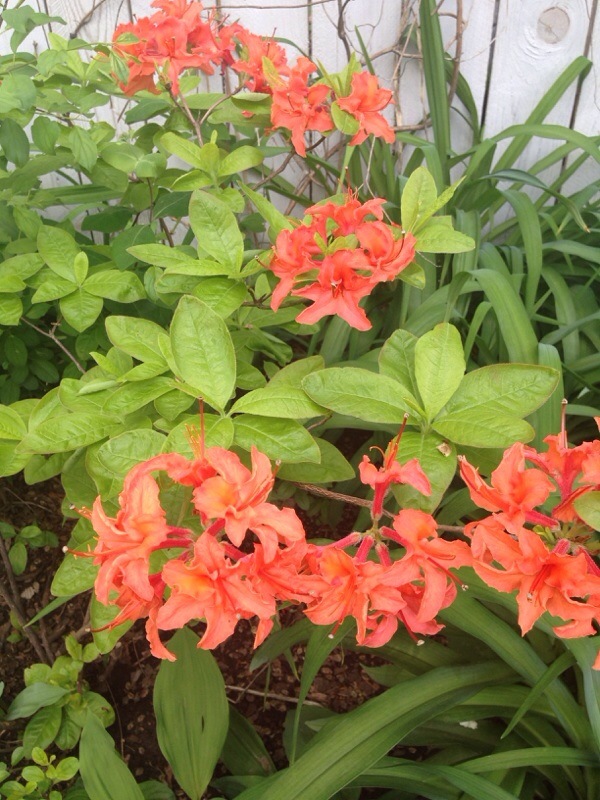 Your stunning flowering shrub is a Rhododendron. As plants, many kinds of these showy evergreen shrubs are grown in various parts of the country. It is a genus of 500-900 species of evergreen and deciduous trees and shrubs. Some can reach the height of 80 ft and some can creep at ground level so you see them as prostrate shrubs. In order to help with identification they have been divided into 5 groups. They are grown for their showy flowers and beautiful array of colors. They like moist, well drained acidic soil. Shallow planting is essential in that they will not tolerate deep planting. Most like dappled shade in sheltered conditions. They do not tolerate heat well so you see them in the northern, cooler climate regions. 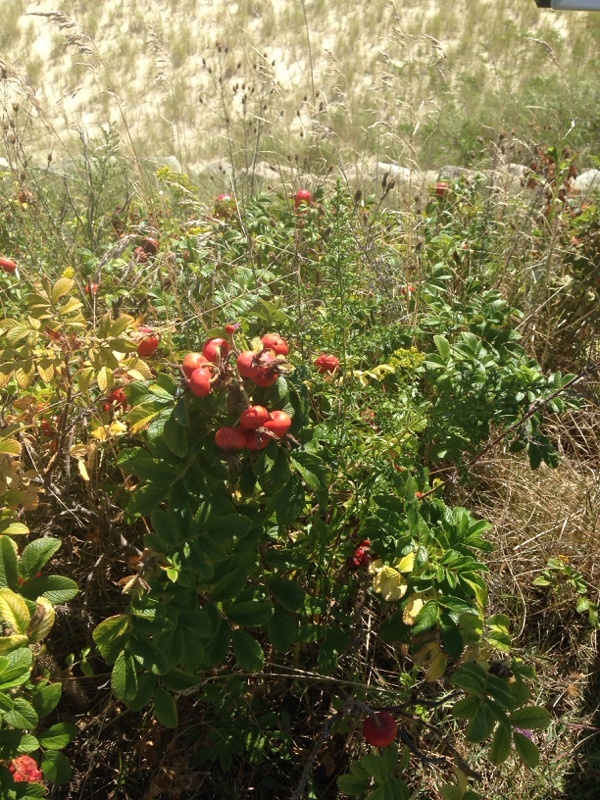 This is a Rosa rugosa, a plant commonly found on sea shores but not native to the Americas. The flowers resemble red carnations and is very thorny with a bush growth habit. 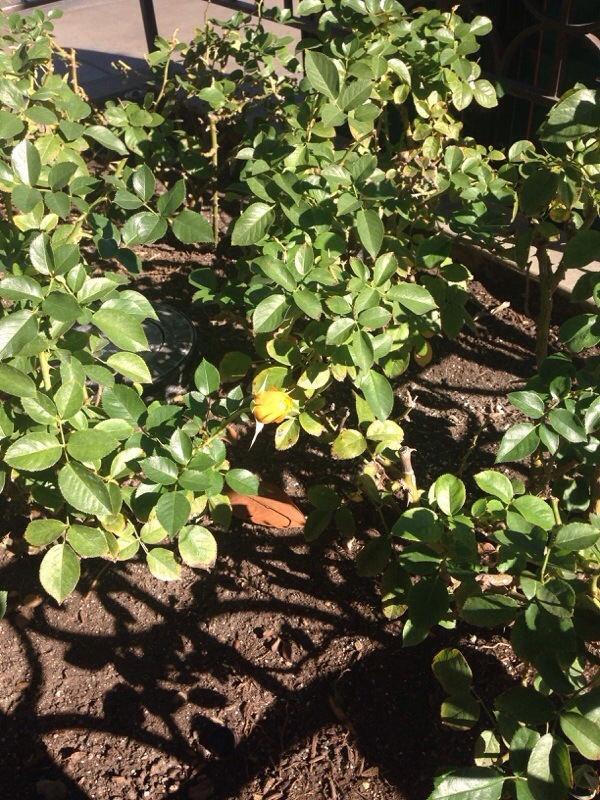 Needs full sun, but will tolerate some shade, regular water and fertilize with a food formulated for roses. Most people who plant this in their landscape come to regret it as they spread all over the place and are very thorny but allow weeds to grow up between and among them. So keeping the area looking good is a challenge. The rose hips (pods you see in your photo) are edible when they are bright red although you can only eat the fleshy covering, not the seeds inside. Many people use them to make jelly, however. These are sometimes mistaken for beach plums, but that is an entirely different plant. 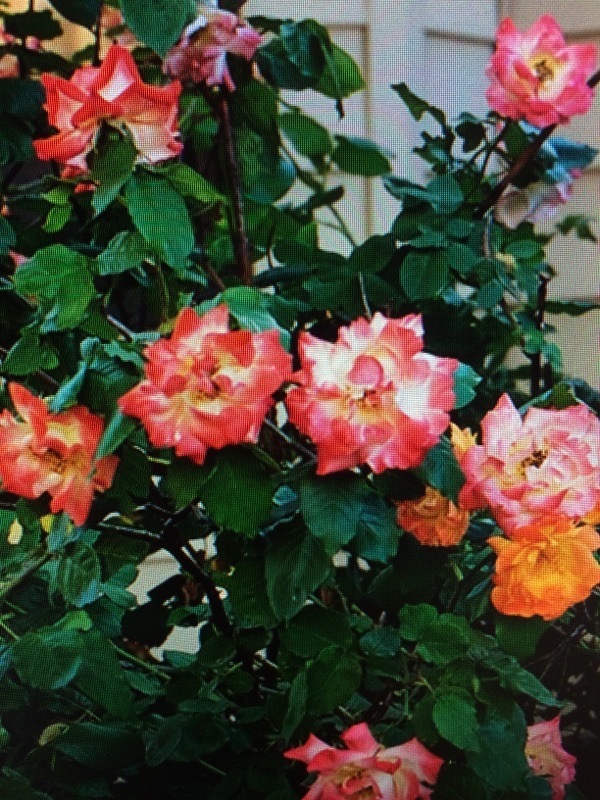 Because there are over150 wild species of shrubs and climbers native to Asia, Europe, North Africa and North America, plus thousands of different garden forms of varying growth and flower types divided into two broad categories Old Garden Roses and Modern Roses, we cannot identify yours specifically. 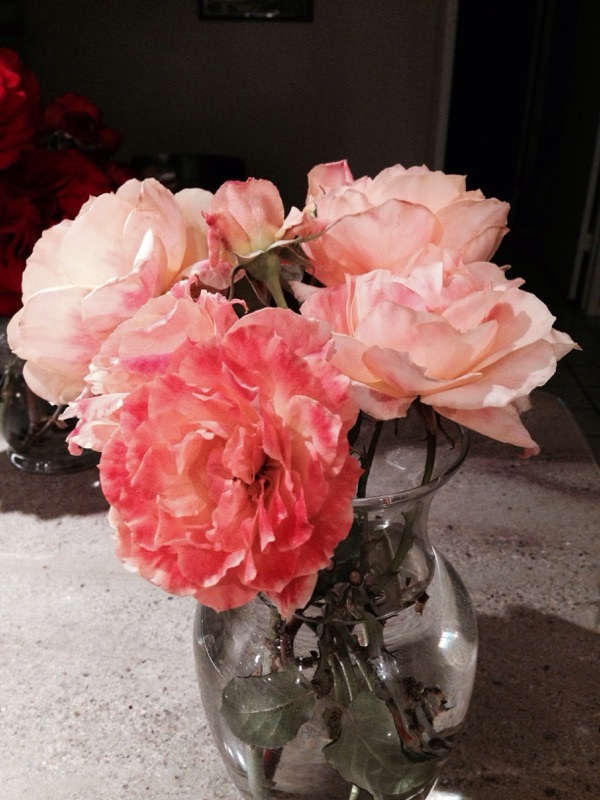 Suggest you show a few clippings to a local garden center that specializes in roses or botanic garden to see if a horticulturist can identify more specifically. You can also visit online websites such as www.helpmefindroses.com or your local rose society such as Pacific Rose Society. All rose plants, however, do best in fill sun with at least 6-8 hours of full sun, soil with good drainage and feed with a slow-release or organic fertilizer formulated for roses. Bristly locust is a much-branched, erect shrub, up to 8 feet tall, forming colonies from root sprouts. Stems and branches are stiff, hairy, coarse, and bristly. Leaves are compound, alternate, deciduous, and densely hairy, divided into 7–19 leaflets, 1 1/2–2 inches long. 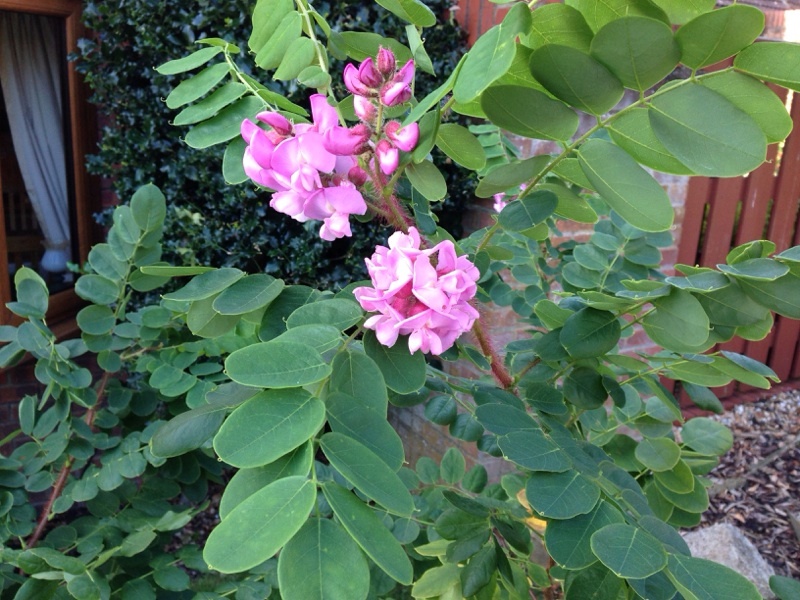 Flowers are in clusters that hang from the leaf axil, dark pink to rose or orchid. They are 2-lipped, the upper lip shorter than the lower. 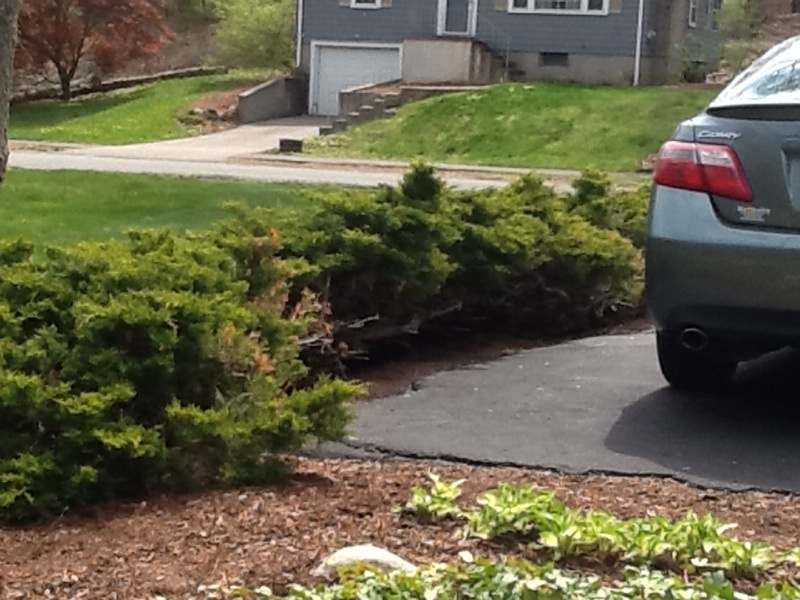 This shrub has been planted for erosion control; in the north it is planted along highways where it acts as a snow fence. Attracts bees and butterflies often followed by reddish-brown seed pods. All part are poisonous if eaten. Does best in full sun, well-drained soil and protected from wind. Prune to control size after blossoms are spent. This looks like it could either be a 'Rainbow Sorbet' or a 'Joseph's Coat' rose, but there are many others that are also similar in shape and coloring. Unfortunately we cannot positively identify the cultivar of rose because there are thousands of different garden forms of varying growth and flower types divided into two broad categories Old Garden Roses and Modern Roses. 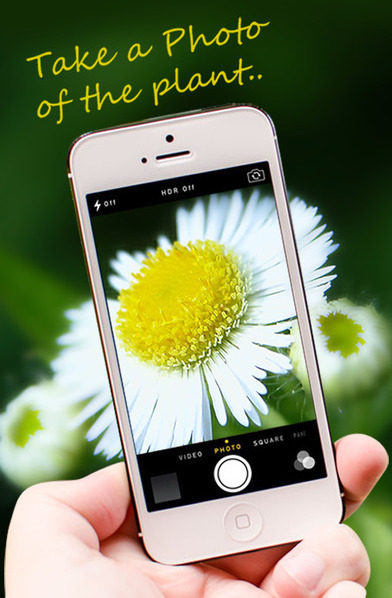 However, you could contact your local rose society such as the Pacific Rose Society or a horticulturist at your local garden center that specializes in roses and hopefully they can identify further for you. Also there are many helpful websites including: www.helpmefindroses.com. All roses do best in full sun with regular water and feed with a slow release or organic fertilizer formulated for roses.